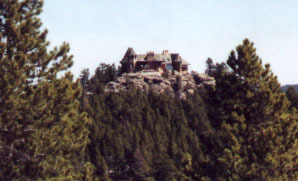 Hardin Castle is situated on top of Thunder Mountain in Conifer, Colorado. It sits at an altitude of about 9000 feet above sea level and has a view of Pikes peak, Estes Park, Mount Evans, and Denver. 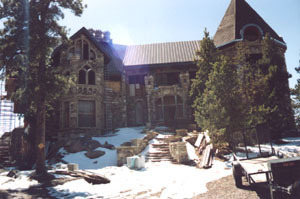 The Castle is owned by Bill & Meme Hardin who are in the process of renovating it. I grew up on the mountain range next to Hardin Castle. After watching the castle from a distance for years, I was granted a brief tour of the building by the owner. I figured I'd share what I saw. Driving through the massive front gates, the first thing on the driveway (more like a private 1/2 mile road) is a very large guesthouse. To the left (south) side of the castle the driveway wraps around to a garage that is underneath the building. The castle is very modern inside even with the beautiful stone walls. To the left of the front door is the kitchen. It had all new appliances and counter tops. 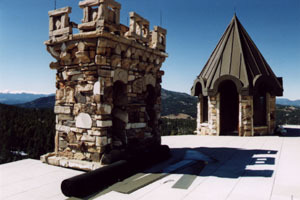 To the right of the front entry is the circular tower and large round room. The only other part of my tour was the rooftop. To access the roof, we walked along a catwalk that dangled over the two story main entry. Once on the roof, I was in awe of the view. A with a complete 360 view, you could see as far as DIA. The roof was made of metal and had several look-out rooms. You can see one of these rooms in the pictures on your page. It is little more than a covered sitting area in which to enjoy the views. In the roof picture, you can also see pikes on the top of the towers. These are lightning rods that ground out at the base of the castle.